Over the weekend, Evolution Toy held a product exhibition showcasing many upcoming previously announced figure’s as well as new figure’s debuted at the event. Thankfully for us, AmiAmi’s Hobby New attended the event and has provided images and some information about several upcoming releases. Notably, several new HAF (Hero Action Figure) prototypes were on display. First up is the titular hero of 1973’2 Inazuman series. Inazuman is one of the classic Ishinomori heroes who’ve yet to have a modern figure produced by Bandai. In their stead, it seems that Evolution has obtained a license to add him to the their HAF line. 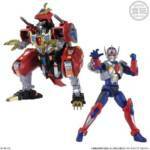 Inazuman is scheduled for release this year for 8800 yen. 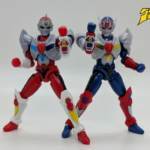 Also, the heroic duo from Space Ironmen Kyodyne, the brothers Grounzel & Skyzel, were announced for release this year in August and September respectively. Each retails for 8800 yen. The previously announced HAF Gridman was also on display, but surprisingly Evolution also announced an HAF Gridman Sigma! This will mark the first time that a modern poseable figure of Sigma (outside of the Super Minipla release) will be released. Specific release info was not announced for Sigma. Rounding things out, the combined hero Triple Fighter was also seen on display again. Set for July release, Triple Fighter retails for, you guessed it, 8800 yen. Given their license to produce Redman figure’s as well, Evolution revealed a Kanegon in colors exclusive to the Redman comic from Matt Frank. No price or specific release month have been announced as of now. This figure will be the inaugural release in a new linen from Evolution, KAF (Kaiju Action Figure.) A reissue of HAF Redman was also confirmed for 2019. So that’s quite a lot on the way from Evolution. Given their past though, we should expect some degree of delay for those figures without specific release info at this point. As more information becomes available for any of these figure’s we’ll be sure to update you. Denkou Choujin Gridman returns after almost 20 years in the form of an animated short that debuted at the Animator Expo, and that very short can now be viewed online both at the convention’s website and on Youtube! 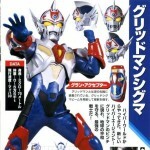 North American readers will most likely recognize this Ultraman esque hero as Servo from Super Human Samurai Cybersquad. But the most interesting aspect about this short is that this is the first time we see Gridman Sigma, from a proposed sequel series that never made it past the concept art phase, keep watching till the end of the short where an adult Takeshi Todo(whom would’ve been Sigma’s partner) shouts “Access Flash!” And transforms into the hero.